Skyrocket your web and community referrals. Reach More Referral Sources. Win More Business. ClearCare’s Customer Relationship Management tools give you the opportunity to take marketing and sales efforts to the next level. Keep track of contacts, activity, and revenue to better inform marketing and sales investments. Send outreach emails directly out of ClearCare. Get delivery confirmation and quickly reference past emails and calls before visiting. When the referral source replies to your email, it's saved so you can see the entire conversation. Store all your brochures, flyers, and promotional tools in the file vault. Attach files to your emails to convey your unique selling propositions. Maintain a list of your contacts for each referral source and track website leads with ease. In this business, every touchpoint is valuable. Track each interaction and set up task workflows. Give all administrators visibility into marketing efforts. Know your best referral sources by volume and revenue, as well as those who haven't referred you recently. 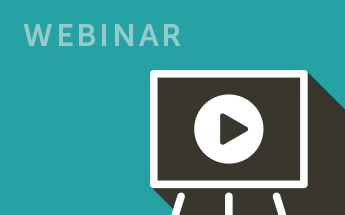 Customize a view based on revenue, referrals, prospects, lead source, client starts, and more. Then choose the type of graph and time period. Share dashboards with staff or your sales and marketing team effectively. 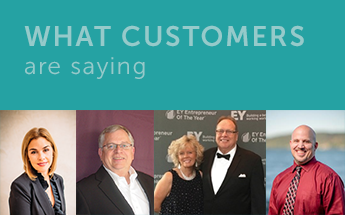 Watch revenue, referrals, and caregiver recruiting closely. Have a potential prospect on the phone? Open up a form in seconds and record the details so you don’t miss a beat. Record each step of the sales process for added transparency, and assign tasks to other administrators so the steps don't fall through the cracks. How much does the Customer Relationship Management module cost? The CRM module is included in the standard price of ClearCare. Can I add multiple contacts for each referral source? Yes! Add the case manager, social worker, Director of Nursing, and any other contacts to any referral source profile. Track referrals and send communications to individuals or a group. 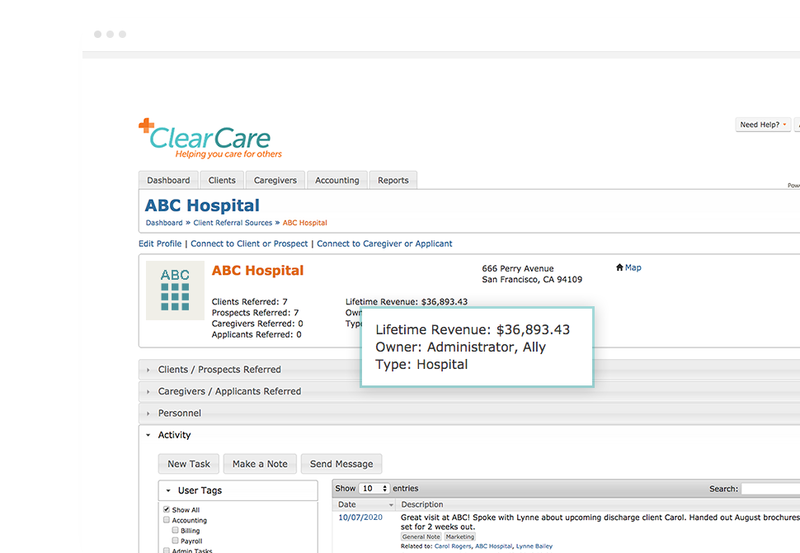 Does ClearCare integrate with other CRM solutions like SalesForce.com, ACT, or InfusionSoft? ClearCare does not integrate with other CRM providers. However, data can be manually exported from ClearCare into other CRM platforms. Can I keep track of the referrals from each facility? Yes! See the lifetime volume and revenue earned from each referral source. Can I email referral sources out of ClearCare? Yes! 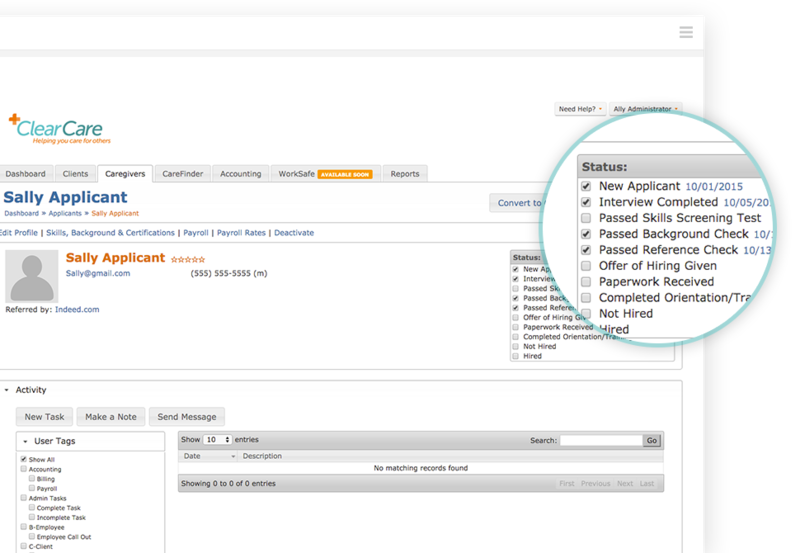 When you email referral sources from within ClearCare you can attach your collateral and receive delivery confirmation. The referral source email replies are also saved so you can reference them later. Can I set up reminders to call or visit a referral source? Yes! Add a note or task reminder so you don't forget to call or revisit when you said you would. Tasks show up on the office calendar to keep everything organized.